Amsterdam, Netherlands: State Art Museum: History, Permanent Collection. One of the World's Best Museums. Founded in 1800, the Rijksmuseum (State Museum) of Amsterdam is the Netherlands National Museum, specializing in arts and crafts. One of the top art museums in Europe, it houses the world's largest and most important collection of 17th Century Dutch painting, featuring some of the greatest works by Dutch realist artists like Rembrandt van Rijn, Jan Vermeer and Frans Hals. In addition, it has a wide range of graphic art and a large collection of Asian art. Other important art museums in the Netherlands include: the Kroller-Muller Museum Otterlo, the Van Gogh Museum (Amsterdam), the Boijmans Van Beuningen (Rotterdam), the Rembrandt House Museum (Amsterdam) and Mauritshuis (The Hague). The Rijksmuseum occupies a historic building on the Museumplein in Amsterdam, close by the Van Gogh Museum, the Stedelijk Museum, and the Concertgebouw. It is the largest museum of fine art in Holland, with the largest permanent collection (managed by 45 curators) and a total staff of around 400. Each year, the Rijksmuseum receives more than a million visitors. Also part of the complex, is the Rijksmuseum Research Library, which is the largest public art history research library in the The Netherlands. Since late 2003, the Rijksmuseum has undergone a major renovation and restoration. However, some parts of the museum remain open to the public. The Rijksmuseum's Philips Wing currently hosts "The Masterpieces" an exhibition which showcases over 400 of the greatest works of art in the museum collection. The renovation continues until 2010: the building is being restored according to designs presented by Spanish architects Antonio Cruz and Antonio Ortiz. There are eighteen works by Rembrandt, including several of his greatest portraits and group portraits, like The Night Watch (1642). Other works include: The Syndics of the Clothmaker's Guild (1662), The Anatomical Lesson of Dr. Deyman, The Jewish Bride (1665-8), Saskia with a Veil, and Self Portrait as the Apostle Paul. 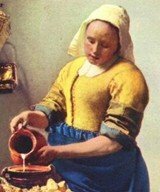 The Rijksmuseum holds four masterpieces of Dutch Realist genre painting by Vermeer, including The Milkmaid 16581660). Other works include: The Love Letter, Woman in Blue Reading a Letter, and The Little Street. The collection has a number of portraits by Frans Hals, including: Portrait of a Young Couple, The Company of Reynier Real, The Jolly Drinker, Portrait of Lucas De Clercq, Portrait of Nicolaes Hasselaer, Portrait of a Man. His most famous masterpiece The Laughing Cavalier (1624) is actually in the Wallace Collection, London. A number of Steen's warm-hearted genre-scenes and portraits are also in the collection, such as: The Feast of Saint Nicholas, The Drunken Pair, The Toilet and Arent Oostwaard and his wife. Hendrick Avercamp (1585-1634), Salomon van Ruysdael (1602-70), Aert van der Neer (1603-77), Adriaen van Ostade (1610-85), William van de Velde the Elder (1611-93), Ferdinand Bol (1616-80), Carel Fabritius (1622-54), Samuel van Hoogstraten (1627-78), Jacob van Ruisdael (1628-82), Pieter de Hooch (1629-83), Meyndert Hobbema (1638-1709), and Jan van Huysum (1682-1749), to name but a few. Although especially strong in 17th century paintings of the Dutch Golden Age, the Rijksmuseum also holds significant collections of western European painting and sculpture, as well as oriental art. Its decorative art holdings feature its famous dolls houses, ceramics including its exquisite collection of Delftware and a magnificent selection of 17th century silverware. The museum's print room has one of Europe's best collections of prints, drawings and other graphic art, including rare illuminated manuscripts. The museum's art collection - comprising over 200 paintings and other decorative objects - opened to the public in 1800 in Huis Ten Bosch, The Hague. The museum was then known as the National Art Gallery (Nationale Kunst-Gallerij). In 1808, on the orders of king Louis Napoleon, brother of Napoleon Bonaparte, the museum moved to Amsterdam acquiring the city's own art collection in the process. The current building, designed by architect Pierre Cuypers, has been in use since 1885, although a number of significant alterations and additions have been made to the structure.  For more information about Europe's greatest art museums, see: Homepage.